I received an election communication from Jeff Smith, the former Labour MP. This is the main message. The middle paragraph forms the core of the unreality of the Labour Party. Theresa May wants to pretend she called this election because of Brexit, but her real aim is to get a get a big Conservative majority so she can impose more cuts on our schools, NHS and public services. Only a strong Labour Party can stop her. A vote for Labour is a vote for investment in jobs, our local services and out childrens’ future. The Prime Minister is not pretending that she called the election because of Brexit. This was the major reason. To anyone who has followed the news in Britain over the last twelve months, leaving the European Union is the major and most pressing political issue facing this country. The timeline of events fits this narrative. The Prime Minister made the announced the snap election for June 8th on April 18th (Guardian, Independent, Telegraph), just three weeks after the Prime Minister’s letter to European Council President Donald Tusk to notifying him of the UK’s intention to leave the EU. This followed a vote in the House of Commons on March 13th sanctioning the triggering of Article 50. On the face of it, Jeff Smith is failing to face reality by making a false claim against his opponent. This false claim is denying the important change to the British Constitution in at least 40 years. ..but her real aim is to get a get a big Conservative majority so she can impose more cuts on our schools, NHS and public services. There is a secondary aim of the Conservatives to balance the eliminate the budget deficit inherited from the last Labour Government. Rather than rapid reductions, the date of balancing the books has been continually put back. In 2010 it was 2015, now it is around 2022. Phillip Hammond takes a more relaxed view of deficits than George Osborne. Only a strong Labour Party can stop her. A strong Labour Party does not exist at the moment. To be strong, the Parliamentary Labour Party need a leader they can unite behind. Jeff Smith, in common with nearly every other Labour Candidate (bar Diane Abbott), does not once mention the leader in his literature. Last June 172 MPs voted Yes to a no confidence motion in Jeremy Corbyn against 40 who voted No. Nearly all of the most experienced MPs refuse to be in the Shadow Cabinet. Further, the leader has always been opposed to some policies in the Labour manifesto, such as renewal of Trident Nuclear Weapons, or anti-terrorist legislation. Corbyns’ closest allies include closet Marxist John McDonnell and a Shadow Home Secretary who is unrepentant about her past support of IRA terrorism. A strong leadership would discipline MPs who defied a party whip, Under normal circumstances anybody who defied a three-line Whip on the most important vote in years would be disciplined. In particular, any member of the front bench team or party whips who defied the Whip would be sacked. Jeff Smith, a party whip. defied the whip on Article 50, did not honorably resign and was not sacked. Jeremy Corbyn is too weak a leader even to control his own MPs. Why should a Labour candidate, who is acutely aware of the wider political realities, blatantly deny those realities by making false accusations? The answer lies in the results of the EU Referendum. In 2015 Labour won 22 of the 27 constituencies in Greater Manchester. 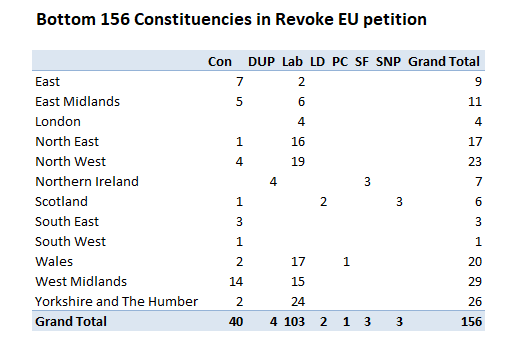 Using Chris Hanretty’s estimated referendum results by constituency, I have created a graph of the referendum results for the 2015 Manchester Labour Constituencies, with the most pro-leave on the left descending to the least. In 16 of the 22 Labour constituencies in Greater Manchester. the estimated Leave vote was greater than the 51.9% National Result. The three most anti-Leave constituencies are in the centre of Manchester. It is Manchester Withington, where Jeff Smith is seeking re-election, that most anti-Leave in the area. 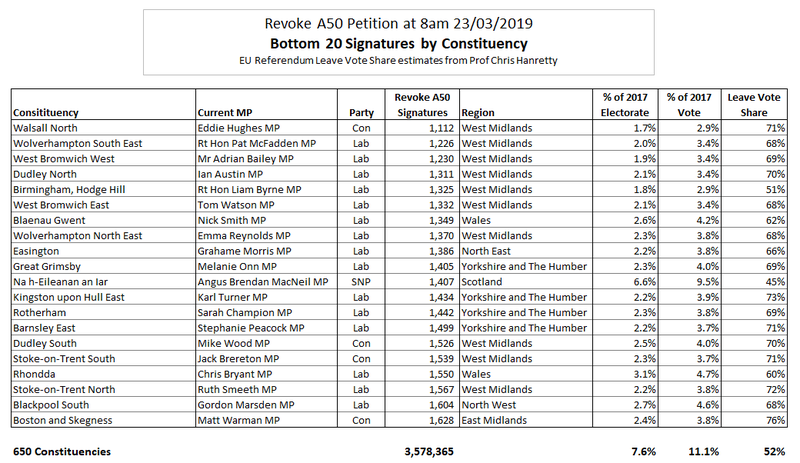 Geographically and politically within Manchester, the pro-Leave constituencies are on the periphery, whilst the three most pro-Remain are at the centre. This is a metaphor for the Labour Party itself over Brexit. The current visible leadership team of the Labour Party (Jeremy Corbyn, John McDonnell, Emily Thornberry and Diane Abbott) are all from London, one of three regions to vote to Remain in the EU. The other nine regions, with three-quarters of the UK population, voted to Leave. Yet a disproportionate proportion of the Labour Membership are both virulently pro-EU and London-based. 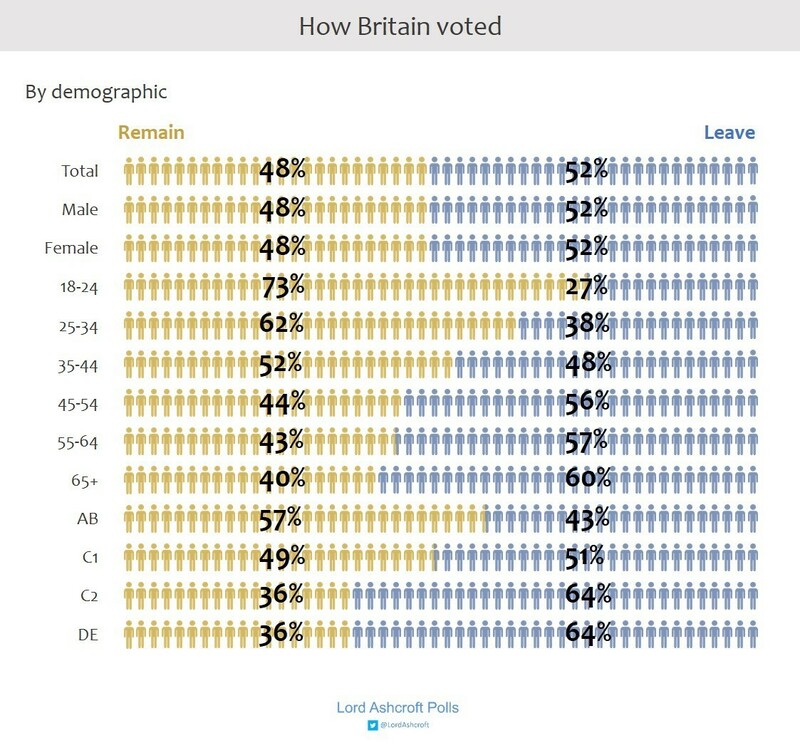 A Yougov survey looking at the how people voted in the EU Referendum, estimated that 65% of those who voted Labour in 2015, voted for Remain in 2016. These results seem to contradict the results in the Greater Manchester Labour constituencies. But this is not the case. 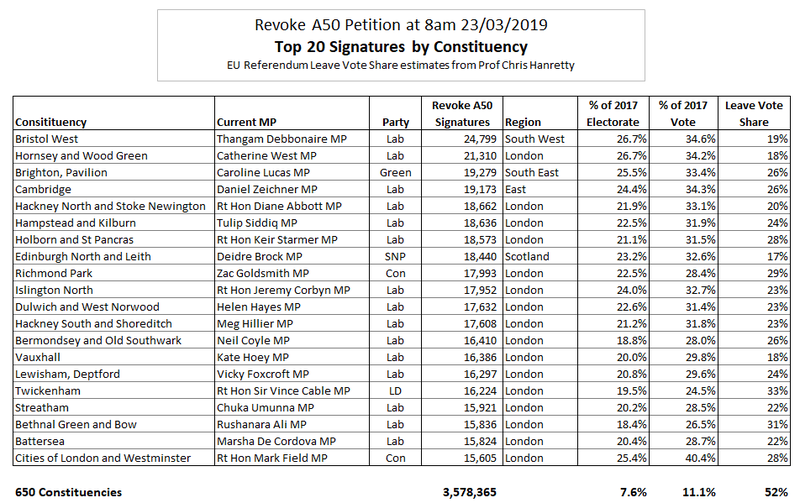 Even with the possibility that a smaller proportion of Manchester Labour voters supported Remain than nationally, there is still the fact that in many Labour constituencies, the non-Labour voters were massively pro-Leave. This puts the Labour Party candidates in a quandary. Support Brexit, going against their beliefs and alienate the Labour Party membership and many of their core voters. Disrespect the result of the Referendum, and the majority of their constituents will be strongly motivated to vote for someone else. Either way they lose. So Labour Candidates can either, like Jeff Smith, openly deny the reality of Brexit, or deliberately exclude any mention that is happening.